Well, I had a quieter weekend planned, but somehow things got a bit out of hand. I’m still looking for the best balance for me in terms of quiet time vs. social time. I did have some wonderful experiences, though! We had a Full Moon circle by our friends’ lovely fire pit on Friday night. Did you see that amazing Pink Full Moon? Wow! On Saturday we had a fun potluck with my extended family, then played D&D with some friends. We had homemade curry and naan for dinner, and lit our own fire in the backyard. Today BlackLion and I had a photo shoot with his Mom, who is an awesome photographer. We’ll be putting them up on our website and in our newsletter soon. That was followed immediately by band practice. So after I write this update, I’m off to bed for some R&R (reading and rest). Good night! I did manage to squeeze in some writing time this weekend, in the mornings. My weekly total is thus 2151 words on the Cultivating Self-Love e-book. Also, I’ve been working on a couple of projects for my publisher, Moon Books. I have a guest blog post due this week, as well as a short piece for a book of essays. Fun projects! I haven’t been posting on my own blogs, aside from updates here, and I really want to get back to regular posting. We once again promoted our conference-related special offer for Feline Dreamers, which ends this Tuesday. No takers thus far, but I’m hopeful. A friend of ours who is an outspoken unschooling advocate offered to spread the word about us to all his Facebook pages and friends, so we wrote up a blurb about Feline Dreamers for him to share. So cool of him to do this for us! I received some interesting mail this week, with a Royal Mail stamp on it. 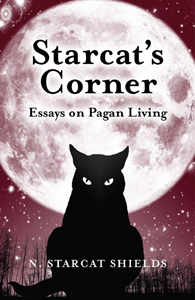 An article I wrote was published in Pagan Dawn quarterly magazine, and they sent me a copy. A great way to get the word out about my book. I hope to write for them again. I really need to call the bookstore lady this week about setting up a signing and reading! Note to self: just do it. My daily writing and dancing practices are both going super well. I’ve continued to keep up with my drumming practice, too. It feels great. I took a couple of walks this week, as well, so that’s been good. Yoga hasn’t happened lately. I have been enjoying sacred space, though – the Full Moon circle was lovely. I didn’t post Sunday as I was gone all weekend, and by the time I would have gotten to it on Monday, well, I figured I might as well wait until Wednesday. So here I am! My weekend involved attending and drumming at a women’s retreat on Saturday, followed by a Dark Follies gig that night (for those not aware, I am a percussionist with the band for a modern Vaudeville troupe – click here to learn more about the troupe). The next day started with Dark Follies rehearsal (including auditioning a new band member), then going with BlackLion to the Dark Follies business lunch (burritos, yum!). In the afternoon I had two meetings: Southern Maine Pagan Pride Day and the Maine Pagan Clergy Association. Then we had time for a walk and a bit of a rest (but not time to drive home and back) before the second Dark Follies gig. Phew! Monday, besides being the day we put together our weekly e-newsletter, was for resting and recovering. So you will understand, dear reader, if I haven’t accomplished much since my last check-in! I’m still feeling good about my progress, though, because I know that these things go in cycles. Late last week I wrote an additional 1397 words on the Cultivating Self-Love e-book, for a weekly total of 3835. Not bad! 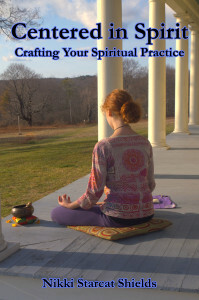 I finished reading and then wrote a review for Zen Druidry by Joanna van der Hoeven. She is an author with the same publisher as me, and we’re trading book reviews. Great book! We promoted our upcoming workshop and a conference-related special offer for Feline Dreamers. We also worked on getting 3 interested folks signed up for our new affiliate program. We made the big decision to attend the Rethinking Everything conference in Texas at the end of August! It will cost us about $2000, but we’re already thinking of how to make it work, including some fundraising and a yard sale/bake sale. I’m so excited about going! I’ve still been doing well with my daily writing and dancing practices. Did a lot of drumming! All 3 gigs went very well. I got asked back to the next women’s retreat! Took a walk today, in the lovely spring sunshine. That’s all for the moment! Blessings on you and your projects. This week has been trucking along rather smoothly. I’m finding I have good forward momentum right now. The weather has been nicer, too, which helps inspire me to work on my projects. I have a busy weekend coming up, so hopefully I’ll be able to make up for it during the rest of this week, and get a bunch of stuff done so I can be out and about on Saturday and Sunday. 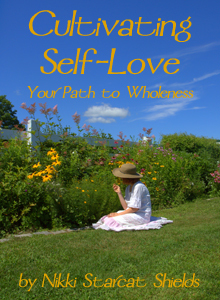 I’ve written 2,438 words on the Cultivating Self-Love e-book so far this week. It’s going well and the topic has been keeping me interested and inspired. I’ve been posting regularly to both blogs. I brainstormed a list of topics for upcoming posts for Starcat’s Corner, too. I submitted a new guest post to Cafe Truth and it was accepted, so I’m 1/3 of the way to this goal. I’m still in the process of outlining my first guest post for my publisher’s blog, due by the end of the month. I completed the Shift Your Biz course and all the related homework. Woo hoo! Goal met! It was very useful, and I’m sure I’ll be using what I’ve learned well into the future. This week I heard back from the owner of a new age shop who I had contacted a couple of months ago. She wants to host me for a book signing and reading. Yay! We’re working out the details. I now have a book giveaway up on GoodReads. I’m giving away 3 copies of my book, and so far 130 folks have requested to be part of the giveaway. See the sidebar if you’d like to join the fun! I’ve been doing well with my daily writing and dancing practices. These past couple of days I’ve focused more on drumming practice, to prepare myself for three upcoming performance gigs this weekend (yeah, I told you I had a busy weekend coming!). Thanks for reading my update. Have a splendid week, everyone! This first part of this week was taken up with resting and recovering from a nasty head cold. Once I started feeling better, though, watch out! My creativity has been flowing and I’ve been getting lots of stuff done. Woo hoo! I’m very happy with how things are progressing, and I hope to carry the momentum over into the coming week. Wrote about 2500 words on the Cultivating Self-Love e-book, so that’s half the goal for half a week’s work. I’m pleased. I also really like how the book is shaping up so far! BlackLion and I wrote up the description of the May workshop, which is titled Introduction to the New Consciousness: Living it Now. I’ve started pondering how we’ll put it together. Goal in progress. Posted to both blogs, and am happy with my progress. I’m in the process of outlining my first guest post for my publisher’s blog, due by the end of the month. I also sent an e-mail inquiry to Kind Over Matter about doing another guest post there. Listened to the Shift Your Biz call that I missed while I was away. Am starting work on the homework, to be completed by Monday evening’s call. We started promoting the new Feline Dreamers workshop via Facebook. The owner of the shop where we’re having the workshop will be posting to his people as well. We connected with the 13 folks who had purchased (or bartered) items from us at the conference, thanking them and asking them to complete a short survey. In the survey, we’re seeking feedback and testimonials. It’s going well so far. I’ve been doing well with my daily writing and dancing practices. I didn’t dance for a couple of days when I was really sick, but that’s to be expected. My eating habits are changing again, and I’m eating less since the conference, without much effort. I’m also drinking more water. I lost 3 pounds. Yay! I missed a Women for All Seasons meeting due to illness. I already have plans to attend the next one, though, and I’m looking forward to it. I want to focus more on drumming practice, especially with the upcoming performance gigs. Welcome to my first Sunday check-in for ROW80! We just returned yesterday from the Life Rocks! Radical Unschooling conference in New Hampshire. It was AMAZING! What an uplifting week full of connections with creative and positive folks of all ages. Here’s just a sampling of some of the things we participated in: discussions about how to encourage freedom in ourselves and our families, the anatomy of a midlife crisis, past lives, socially-conscious entrepreneurship, and permaculture; drum circles; meditation and yoga; building faeries houses; hanging out in the hot tub; my daughter doing her awesome hula-hoop and poi spinning for the Talent Show; making vision boards; and being hypnotized. Yes, really. I return to my regularly-scheduled life feeling very inspired and also somewhat exhausted. As to our goals for the week, we rocked! We added 27 new subscribers to our newsletter list (our goal was 10). We had meaningful connections with many folks, some we had met before and others who are new to us. We sold 10 copies of my book (the goal was 5) and 3 copies of our CD (the goal was 4, but we also traded 2 more for music CDs by folks at the conference, so our total is really 5). We haven’t sold any Core Belief Kits to conference-goers yet, but our special offer goes until the end of the month, and we’ll be reminding folks about it soon. Most importantly, I have achieved my goal to “significantly uplift my energy vibrations surrounding prosperity, and in particular, about making money from my creative callings.” We did great at the Renegade Bazaar, and are feeling connected with our wider community in ways that go beyond prosperity into wider levels of sharing. OK, I’m rambling, so it’s time to rest. Suffice it to say that I consider the week a complete success!